We have been running Windows 10 version 1803 (April 2018 Update) on our non-critical computers. Other than the new Timeline feature(which we’ll cover in-depth later) and more user options when choosing graphics options, most of the changes in 1803 are under the hood. Today, we’re going to cover some of these changes. In the screenshot below, on the left you can see the Windows 10 Version 1709 (Fall Creators Update) Settings > System Menu. 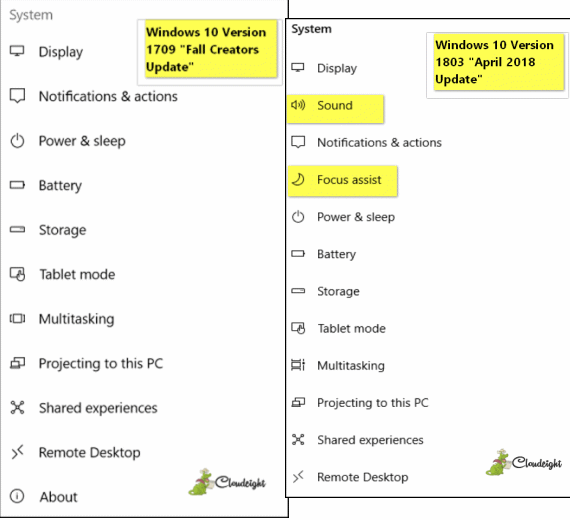 On the right, Windows 10 Version 1803 (April 2018 Update) Settings > System menu. You’ll notice that Microsoft has moved Sound out of the Control Panel and into Settings. Also they’ve added the Apple-inspired Focus Assist. Settings > System > Sound makes it easier for you to configure sound and and microphone options. 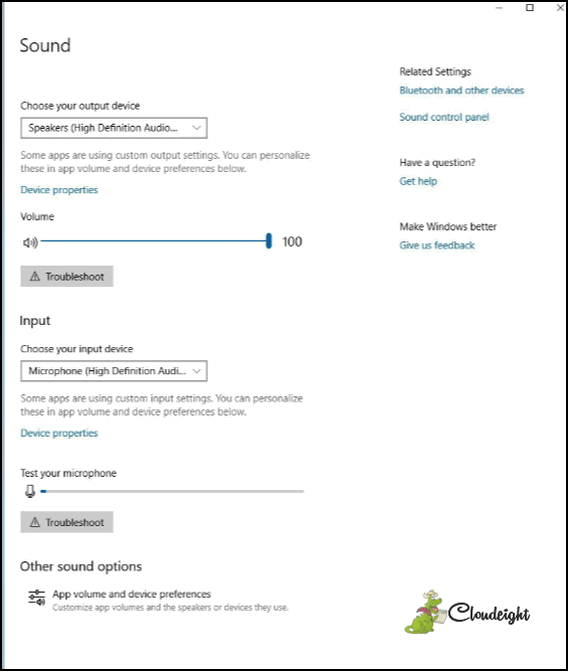 Note that Microsoft has added troubleshooting options and app sound preferences. 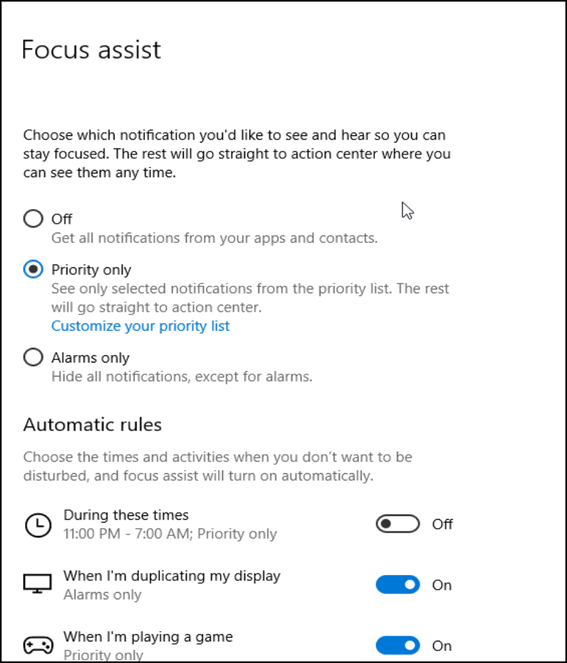 The Focus assist feature will be of interest to Windows 10 users who use and rely on Windows 10 notifications. Focus assist allows you to set priorities to notifications if you don’t want minor notification popping up when you don’t want to be distracted. You can create a priority list of applications from which you want to allow notifications any time. Focus assist is available from the Settings > System menu. 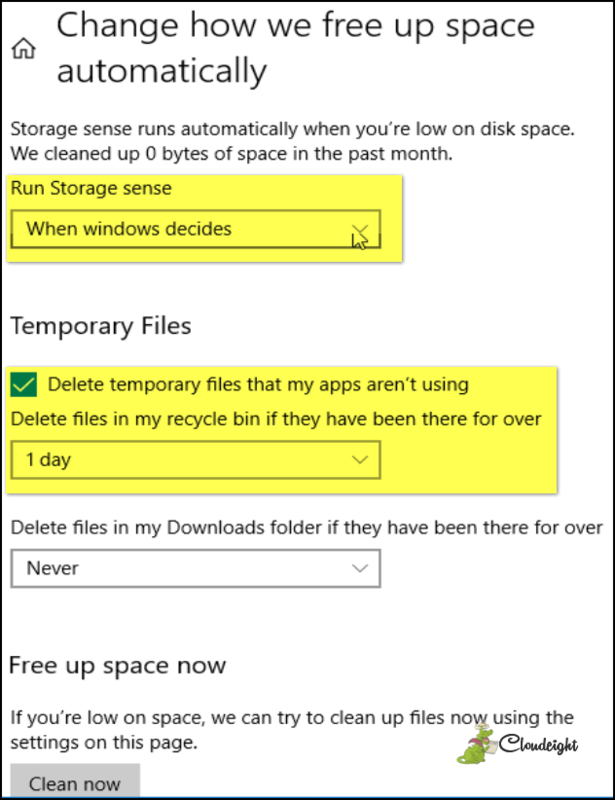 Storage sense was available in previous versions of Windows 10. Storage space in Windows 10 Version 10 gives you more control over how Windows removes junk and temporary files that clutter up your computer. Storage sense empowers users to keep their computers cleaner automatically. Storage sense is easy to set up and intuitive. Storage sense is available from the Settings > System menu. 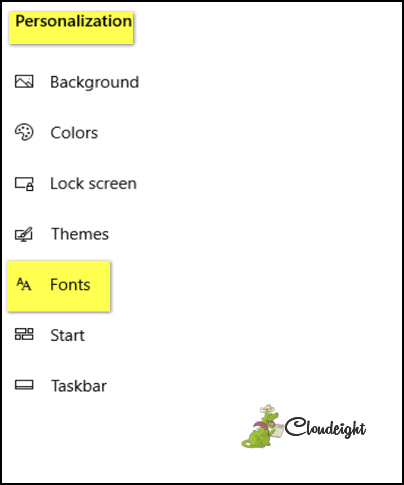 In their continuing effort relegate Control Panel to the ash heap of Windows history, Microsoft has moved Fonts from Control Pane to Settings > System > Fonts. In Windows 10 version 1803, your fonts are presented in a much cleaner ad nicer way than in previous versions of Windows. 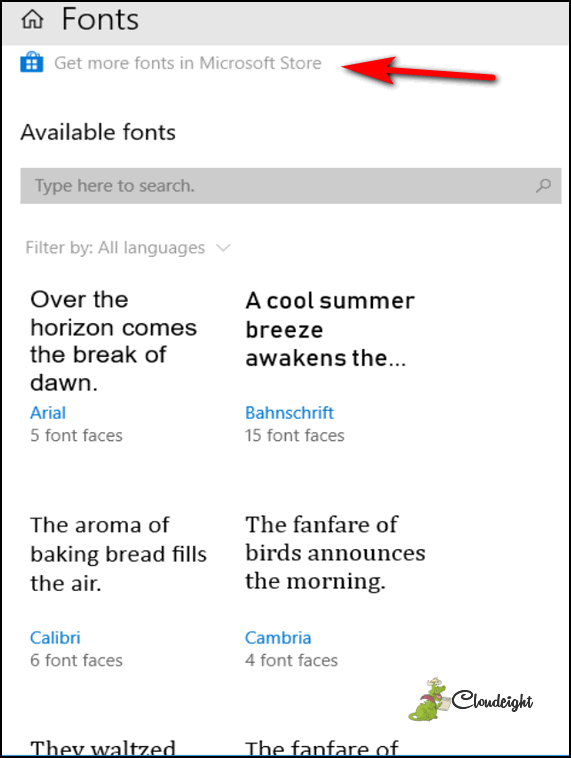 Note also, you can get more fonts from the Microsoft Store – but not all fonts in the Windows Store are free. 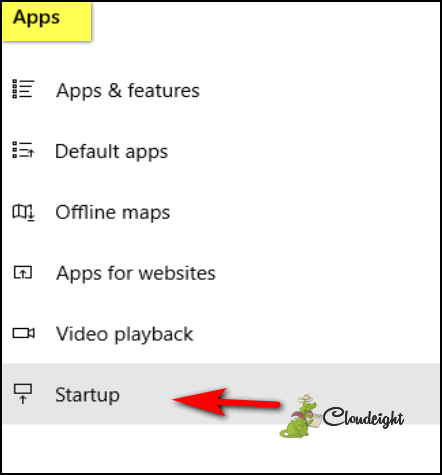 Windows 10 version 1803 adds Startup to Settings > Apps > Startup. 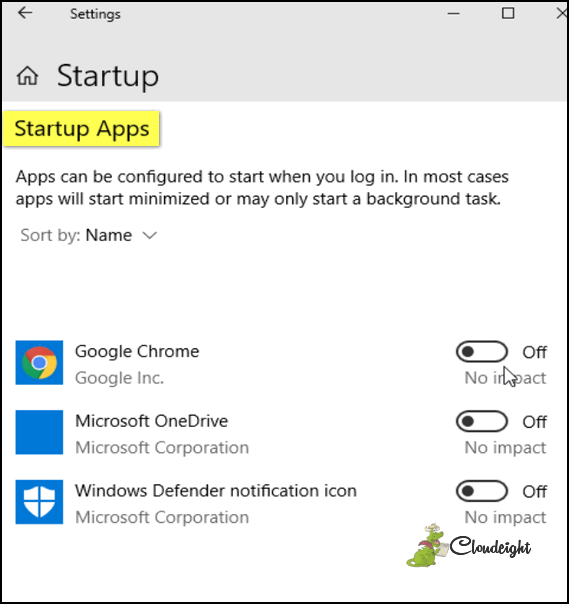 Startup lets you enable or disable apps and programs that start with Windows. As we all know so well, too many programs starting with Windows can have a negative impact on system performance. Curiously, Startup can be accessed from Task Manager’s Startup tab as well. Task Manager has had a Startup tab in every previous version of Windows 10. While we hoped that Microsoft would make the Startup function more powerful, it remains as it was in previous version of Windows 10. The only difference is in Windows 10 Version 1803, you can access Startup from Settings > Apps > Startup or Task Manager’s Startup tab. No matter how you get there, Startup is the same. Thank you for reading! We’ll have more and more tips and info about the newest version of Windows 10 in the coming days. It is a big help!!!! I just received an HEIC file that I can’t open. It’s a photo of my sister’s 87th birthday and I would love to print it. I’ve had no success. I see items to download that will convert the file but I’m not sure what to trust. What would you do to convert this file to jpeg? I do have the Windows Spring update. Thanks, as always, for your excellent help!! Have you tried https://www.zamzar.com?. Zamzar can convert hundreds of file types. It’s worth a look. I sent you a link to another site https://heictojpg.com/ – please let us know if that works for you.